Another rehearsal devoted entirely to Step Up with our adopted composer Gaynor & her Making Music mentor both present. Having been given the completed score a month ago with “note bashing” rehearsals in between, tonight was a real opportunity to start polishing the piece under the watchful ear of the composer. 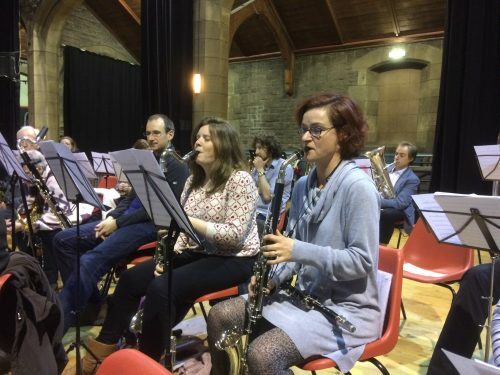 Under the baton of our MD Sarah the focus of the rehearsal was very much on dynamics and rhythmic precision. Without wishing to give away too much of the piece there are sections where contrasting rhythms overlap one another that require exact execution for the effect of the music to take hold. Time too was given to a section of the piece that features solos from across the band over an “ad lib” repeated or cyclical measure. But perhaps I’m revealing too much. As always it was a pleasure to have Gaynor present to offer her thoughts & to coach & coax us as we rehearsed. With only a few weeks to the premier performance we have a great piece of music, a great idea of what is required of us as players and an idea of what is still to be done. I for one am looking forward to June the 16th; and I’m sure I’m not the only one.